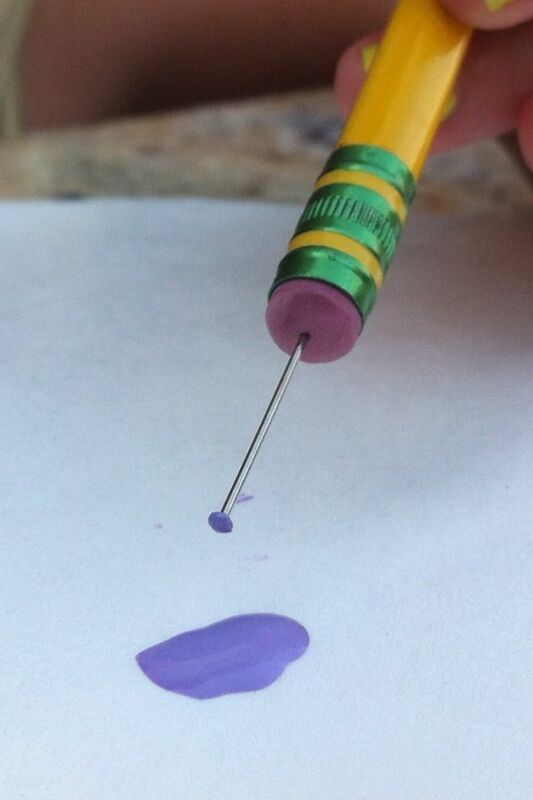 Here is a quick way to make a lollipop stick pencil holder. At the end of the year teacher get gifts and this is a great one for your little ones to make something easy and quick they can use themselves or give to their teacher..
Have you often wondered how they make those beautiful roses made of silk or satin ribbons? They are becoming more and more popular now especially for special occasions such as wedding, christenings and anniversaries. The reason is simple you can keep them forever and they make a wonderful keepsake. This entry was posted in Autumn Ideas and tagged satin ribbon roses, making roses, ribbon roses on September 6, 2014 by admin. Do you get fed up with your pocket weighing down with loose change? we seem to accumulate it every time we go out shopping. The bottom of my purse can have at least 3 of 4 pounds worth of loose change at anyone time. So we have found this great Felt Piggy Bank craft idea that you can take around in your purse and keep your change in one place. A fuzzy, fat pig in the bottom of your purse will be much easier to grab a hold of than loose change. This entry was posted in Half Term Ideas and tagged felt craft ideas on August 16, 2014 by admin. This is a great quick and fun idea, we have lots of buttons on our website so if you dont have your own to choose from then you only need to check out the button section for all your needs. Pick out your favourite buttons you want to use, to balance the threaded string, use all 4 or all 2 holed buttons. This entry was posted in Half Term Ideas on August 10, 2014 by admin. Here is a quick and easy craft idea that is a lot of fun to create. Is your fridge covered in postcards, shopping lists and lovely paintings brought home from school? Well I know mine is and everything was held on with various stickers, blue tac, you name it. Then one good gust of wind from the back kitchen door and half of it would be on the kitchen floor. This entry was posted in Half Term Ideas on July 27, 2014 by admin. This is a quick and easy craft for mums and daughters or any female loved one in your family. You only need to be able to sew, a handful of your favourite buttons and a piece of felt and your imagination. This entry was posted in Half Term Ideas on July 16, 2014 by admin. This is a great easy craft for your children to create. It's so versatile too, you can use whatever materials you like to create this picture and any different coloured buttons or paints, just let your imagination flow. This is a great craft for birthday presents, anniversaries, Mothers Day, Fathers Day Etc. Change the colours to suit the occasion and a masterpiece will follow I'm sure. This entry was posted in Half Term Ideas and tagged childrens crafts, button crafts on July 9, 2014 by admin. Do you want to help your daughter make some Barbie style super stylish hairpins? Great looking hair pins can be really expensive. So, the best option is to make your own stylish hairpins. You can use colourful mixed buttons and get some great designs. This entry was posted in Half Term Ideas and tagged button hair clips, hair clips on June 27, 2014 by admin. This entry was posted in Uncategorized on June 14, 2014 by admin. Make an easy picture frame out of craft sticks or lollipop sticks. Find lots of creative ideas and tips to spice up this simple easy classic craft. This entry was posted in Fathers Day Craft Ideas on June 12, 2014 by admin. This sticky notepad holder is useful and easy to make. Ideal for children aged 6-10. This entry was posted in Fathers Day Craft Ideas on June 8, 2014 by admin. Here is a great Fathers Day Craft your little ones can make. Print out the word "Daddy" onto a piece of white heavy paper / card. You could also hand-write it if you don't have a printer. Any kind of paper works, but heavier card will have more durability. Make the printing or writing quite large so that if your child places pom poms over the letters you can still read the word. This entry was posted in Fathers Day Craft Ideas on June 5, 2014 by admin. If you've got kids, it’s always ideal to have activities in hand in cases of rainy afternoons. Weekends are supposed to be spent outside or at their friends’ house but when the weather is awful, there’s nothing you can do but to stay in the house. While watching TV and playing with their devices are much preferred afternoon activities for the kids of today, you can prevent your kids from doing these by preparing some craft activities that they can do with you. 1. Button Art Greeting Cards – Prepare some cards, markers, paint, glue, and some buttons. Tell your kids to stick buttons wherever on the cards and to draw any image using the button. The buttons could be the wheels of a car, balloons, the middle of flowers, lollipops – just absolutely anything. Once you’re done making them, tell them you’ll set them aside so you’ll have cards ready to give out for special occasions such as Mother’s Day or Grandma’s birthday. 2. Monogram – Cut out some board paper, about half of a regular A4 size. Prepare some buttons, glue, and pencils. Tell your kids to draw a monogram of the letter of their first name. Once the letter is done, glue on the buttons over the entire letter. You can put holes on the upper corners, tie some ribbon or string, and put them up on the walls of your kids’ room or on their door. 3. Button Tree – This is perfect for a Spring activity. Prepare some illustration boards, green and brown poster colour, glue, and plenty of buttons. Ask your kids to paint huge trees with branches but without leaves. Once the paint is dry, tell your kids to glue buttons on the trees as if they were the leaves. The more colourful the buttons, the better. 4. Animal Puppets – Put on a puppet show after making these animal puppets. Prepare brown paper bags, coloured paper, glue, paint, and a few black buttons. Tell your kids to think of an animal they’d want to be. An easy one is a bunny. Draw a circle on pink paper, cut it out and glue on the fold of the upside down brown paper bag. Create other circles to make the face of the bunny. Cut out two long ears and stick on the tip of the brown paper bag. Stick two black buttons to serve as the bunny’s eyes and paint some whiskers. Create other animals for a fun puppet show. 5. Button Rings – This craft is ideal for girls but boys can join, too. Prepare some big plastic buttons with big holes on them and a few strings of ribbon that can pass through the holes. String a ribbon through the holes of the button, attach to a finger, and tie it by making a bow. There are countless crafts with buttons that you can do on a rainy day. All you need to do is prepare the materials before the rainy season arrives, and keep the digital devices away for a productive and fun afternoon at home. This entry was posted in Half Term Ideas on May 11, 2014 by admin. What better way to let the kids get creative than to let them create and design their own towns? 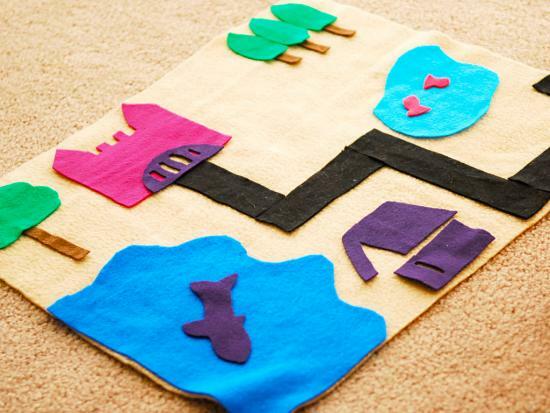 The sky is the limit to what they can get creative with for this super fun play mat that is easily folded up and stored anywhere. This entry was posted in Half Term Ideas and tagged easy crafts. felt crafts, half term ideas on May 9, 2014 by admin. Whilst Easter is a religious holiday one of the most iconic symbols of Easter is the Easter bunny. Though the bunny is never mentioned in the Bible as a symbol of Easter, our tradition has always included it. Word has it that this tradition was brought to the US by the Germans, through a book that referenced the hare as the one who brings the Easter eggs to the children. Ever since it was practised in the US, the Easter bunny has always become one of the best symbols of Easter. If you’re planning on holding an egg hunt for your children, decorating your garden or home is a great idea to make it more lively. You don’t have to spend too much though because the eggs, the basket, the food, and the prizes already cost a fair penny. If you have the time this weekend, you can make your very own Easter Sunday decorations with your children using very simple materials. This entry was posted in Easter Ideas on April 14, 2014 by admin. This is very easy to make and with a bit of glue paper, paint and a few buttons your little ones can make you a great paperweight. This entry was posted in Mothers Day Craft Ideas on March 21, 2014 by admin. Mothers are the light of the family, and it’s only fitting that they are given a special day every year where they are celebrated. But it’s not only actual mothers who receive special attention on this special occasion. Sons, daughters, and grandchildren hold the privilege of making this day special for the mothers in their lives. It is common to give gifts and cake, but the more heartwarming gifts of all are ones that are made from the heart. This is why home-made cards and DIY gifts are much more appreciated by mothers – as you simply did not just buy them from a store. DIY gifts show that you took the extra special time to make something that you know will bring a smile to your mum or gran. Here are two simple Mother’s Day crafts that will surely brighten your mum’s face. The first one is a paper flower arrangement that your mum can place in the living room of your house or on her desk at the office. The second one is a quirky paper weight craft that will surely make your mum laugh. This entry was posted in Mothers Day Craft Ideas on March 14, 2014 by admin. This entry was posted in Valentines Ideas on February 12, 2014 by admin. Valentine Heart Button Banner for your party. Simple and easy to make craft idea to keep your children busy crafting. This entry was posted in Valentines Ideas on February 6, 2014 by admin. Step 1: Draw a heart in the middle of the pillow case and set aside. Step 2: Cut the ribbon into strips of 10” in size. This entry was posted in Valentines Ideas on February 3, 2014 by admin. These simple to make decorations will give your little ones plenty to do over the break this Christmas time. You can use any old buttons you can find but green and brown are a good combination. Then you only need some floristry or binding wire. Thread three or four small buttons to make the base by looping the wire in a U shape. Then start with a large button for the base of the tree and work up with small buttons changing colours as you go until you have a nice tree shape. You can then add a star shape button to the top and give it a few twists to hold the buttons in place. Then make a small loop and cut to size to hang from the tree. This entry was posted in Christmas Party Ideas on December 17, 2013 by admin. Here is a super fast super simple mini Christmas tree table decoration for you or your children to enjoy this Christmas time. All you need are some pine cones, some pva glue and some pom poms. You can sprinkle with glitter if you like to add a little extra sparkle but that is it. Get our mixed coloured bags of pom poms so you can do different or multi coloured decorations. Simple lightly glue the inside of the open pine cones and leave for 30 seconds for the glue to become slightly tacky. Then just take your favourite coloured pom poms and glue to the open parts of the pine cones and that is it!!!! This entry was posted in Christmas Party Ideas on December 8, 2013 by admin. Tasty Christmas Olive Pingu Penguins! The party food is very simple to make and will really wow your guests and family whilst delivering a north pole feel to your display. For all the olive and cheese fans in your family get ready to wow them with this simple fast idea. The quantities can vary depending on the number of guests you are expecting so you decide but here is what you need. Now push a cocktail stick through the head and place through the remainder of the body and secure into the carrot base for the feet. This entry was posted in Christmas Party Ideas on December 3, 2013 by admin. We posted this image we found online for decorating a gingerbread men for the Christmas party. So we included the image and a recipe for making gingerbread men Reindeer!!! When you are having your crafting parties over the Christmas period you can make a batch of these gingerbread men and then turn them into Reindeer's! Yes very easy just turn them upside down and decorate with icing to create these wonderful reindeer characters. This entry was posted in Christmas Party Ideas on December 1, 2013 by admin. Halloween Glowing Mummy Light. This craft project makes use of a recycled jar and a few meters of satin ribbon. You can make several mummy lamps and place it right outside your front garden, lighting a pathway to your front door for trick or treaters. Or, if you have an outdoor party on Halloween, you can place them on tables as centrepieces. This entry was posted in Uncategorized on October 28, 2013 by admin. Another great children’s craft project is the apple wreath. This is great for decorating blank walls or on your main door as a welcome décor for your guests as they enter your house or class room. This entry was posted in Autumn Ideas on September 14, 2013 by admin. One of the year's most family-oriented celebrations, the September Harvest Festival is a great time to celebrate and give thanks to the hard work of farmers and the bountiful produce of the earth. Though in today's modern times the actual harvesting is limited to those who actually own farms, this celebration is still a great time to get together with friends and family to serve as a thanksgiving to every blessing that one receives. This entry was posted in Autumn Ideas on September 11, 2013 by admin. There are so many things that you can do with sequins. Those shiny little discs that come in all colours shapes, and sizes can add sparkle to any object and craft project available there is. They are especially much in demand for holiday and Christmas craft projects that brighten any room. Here are four craft projects that you can do with sequins. This entry was posted in Half Term Ideas and tagged sequins for crafting, sequins, blue sequins on May 14, 2013 by admin. White feathers are fun arts and crafts materials that add depth and texture to any craft project. They're also very easy to use especially for children since all you have to do with them is to glue them on surfaces. There are many craft projects that can be done with white feathers and here are three simple projects that your children can do during those boring afternoons or for their fashion and costume needs. This entry was posted in Half Term Ideas and tagged white feathers, feathers for crafting, feathers on May 6, 2013 by admin. Crafting can be enjoyed by anyone and it is very popular with creative individuals. Some do it as a hobby and others actually create crafts professionally. Whether making beautiful things is something that you do for fun or as a living, one trimming that is never absent in any person's craft box is satin ribbon. This entry was posted in Half Term Ideas and tagged satin ribbon ideas, satin ribbon crafting ideas, satin ribbon, crafting ideas on April 7, 2013 by admin. One of the favorite things when it comes to the Easter holidays is to indulge one’s self in the presence of creating different types of craft ideas. The Easter break is not just about chocolate, ok well maybe it is but there are lovely craft things you can do too!! As we know that finding things to do with your little ones is always on the agenda. Here at Anycraft we are constantly looking for craft ideas for children and adults too. This entry was posted in Easter Ideas and tagged ideas for easter time, half term carft ideas, easter ideas on March 20, 2013 by admin. This entry was posted in Easter Ideas on March 10, 2013 by admin. The use of buttons as a setting for craft ideas has never really failed to amaze most crafters and we have a great craft idea for Easter that can let you create amazing looking eggs to wow your friends and family. This entry was posted in Easter Ideas on March 4, 2013 by admin. Create a heart shaped template, similar to the one in the picture at the required size. Cut out two hearts from pink felt and one from pink card. Use all-purpose glue to stick the three hearts together, sandwiching the card heart between the two felt hearts. This entry was posted in Valentines Ideas on January 15, 2013 by admin. Button wreaths are easy and fun ornament for kids to make for the Christmas tree. These cute crafts also are great to use as decorations on wreaths, make as garland, or place on a doorknob. Cut a piece of thin craft wire with scissors, roughly 6 to 8 inches long. Form the cut craft wire into the shape of a circle (just to shape the wire so that the buttons do not fall off). This entry was posted in Christmas Party Ideas on November 27, 2012 by admin.